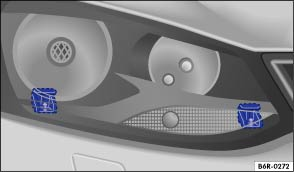 Depending on the vehicle variant, the headlight may have to be removed in order to replace the bulb. You will need the screwdriver with the torx blade from the vehicle toolkit to remove the headlights . Switch off the lights and ignition. Use the torx key to remove the screws . Press the bottom of the headlight out of the guides in the direction of the arrow . 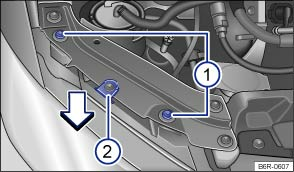 Disconnect the connection on the headlight by pressing the connector towards the headlight housing and simultaneously pressing the lug on the connector to disengage. Then remove the connector from the headlight. Pull the headlight forwards and all the way out of the vehicle . Push the headlight into the vehicle until it reaches the upper stop in the middle . Make sure that the headlight fits properly into the lower guides . Insert the connector into the connection point on the headlight housing. You should feel it click into place. Screw the screws into the headlight housing. Push the headlight against the upper middle position and tighten the screws ① with the torx key. Close the bonnet and check that the headlight is positioned properly.